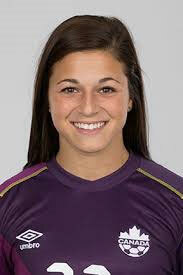 Sabrina D’Angelo a former Notre Dame Welland fighting Irish is currently a Canadian National Team goalie. She made her debut in the Canadian youth program as a 14-year-old in 2007 that won bronze at the CONCACAF U-17 Women’s Championship which qualified Canada for the first ever FIFA U-17 Women’s World Cup in 2008. In 2010, she started all five games of the CONCACAF U-17 Women’s Championship as Canada won the gold medal and was the starting goalkeeper for Canada at the FIFA U-17 Women’s World Cup. In 2012, D’Angelo backstopped Canada to silver at the CONCACAF U-20 Championship, qualifying the team for the FIFA U-20 Women’s World Cup and earning her Canadian Female U-20 Player of the Year honours. D’Angelo made her senior national team debut in 2016, helping Canada win the Algarve Cup. She was part of the Olympic team that won a Bronze Medal in the Rio Olympic Games. D’Angelo attended the University of South Carolina, setting school records, including career minutes in goal (7535) and career matches started by a goalkeeper (81) as well as the senior record for shutouts (10 in 2014). She was the 2014 recipient of the school’s President’s Award, the highest honour given to a student-athlete. Sabrina currently plays for the Western New York Flash in the National Women’s Soccer League which won the league championship earning her player of the game honours.